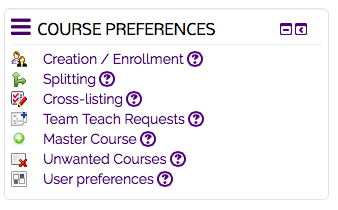 The Course Preferences Block is located on the My Home page of Moodle. This block contains several links to settings that can be personalized according to the instructors perference. Creation / Enrollment - Creation and Enrollment settings allow instructors to specify when an online course is created and enrolled in Moodle.In addition, the instructor can also make decisions about how the course is created. Splitting - Splitting allows an instructor to separate online courses with two or more sections into multiple online courses. This is especially useful for separating the gradebook and other activities. Cross-listing - Cross-listing enables an instructor to combine sections from different multiple courses into a single online course. Team Teach Requests - Team teach requests are made by an instructor who wants to Team teach with one or multiple instructors. There is one request for each department and course number desired. For example: to team teach with one or more instructors in BIOL 1201, only one request is required. Master Course - A Master Course is a Moodle course designated to store course materials for selected courses. These created courses will not contain student enrollment. Unwanted - Unwanted sections will be removed from Moodle. Undoing an unwanted selection will re-enroll and/or re-create the sections in Moodle. User Preferences - Users are allowed to change their first name to a preferred name once. It can then only be reset or edited by a Moodle administrator.